Last edited by forcemajeure on Sat Nov 02, 2013 6:12 pm, edited 4 times in total. Did you take the engine out to Paint it? Last edited by forcemajeure on Tue Mar 27, 2012 6:04 am, edited 2 times in total. Love your work! Where in the world are you? there are no imitations or fake vht brand paints right? This is a great thread. It's giving me lots of ideas for my bike. How is your frame? Any rust at all? I'm about to strip my bike down and inspect the frame. I would love to have it powder coated or re-spray it. Love your work bro! Keep the pictures coming! I really like the shiny red spring! Wish mine would be looking so nice! Can you please post some more details or even pictures on how you disassembled/reassembled the spring?! If the procedure is not too complicated, I would like to do the same. Maybe you could even post some simple guide in the DIY section!? Last edited by forcemajeure on Sat Apr 14, 2012 3:01 am, edited 1 time in total. Thanks for the details! Sounds like it's rather difficult for me to do this myself with almost no tools. Last edited by forcemajeure on Fri May 04, 2012 10:40 am, edited 1 time in total. Great work, keep it coming! I wish I had some extra time to work on my hornet! 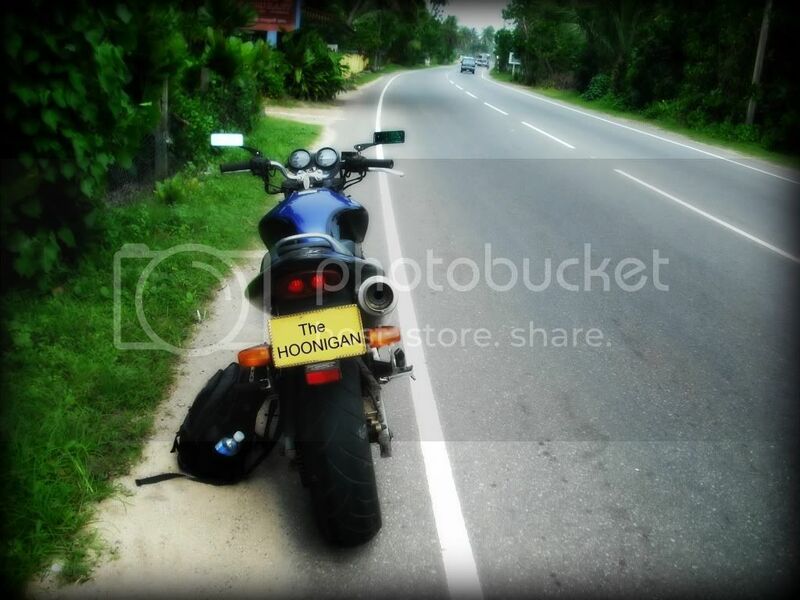 Have you thought about CBR954 tail light modification? The CBR954 tail light is only $30 from Hong Kong. by the way after I replaced my front signal lights.. the lights blink much faster..
is that just ok? or should it be the same way like before? your stock handle bar is not the original one is it? coz it seems a bit higher than what ive got on mine.. Yes the signal lights will blink faster only if you are using a lower voltage bulb. Ive got the same problem on mine... I got rid of my front signal lights as the stock ones were too big and i am yet to find a small blinker... and in the mean time my rear lights blink really fast... its kinda funny... but also looks cool! the old one must have come from a super four? so the new one I have right now... is the one closer to the original handle bar of hornet 250? where in the world can I find the cover for the allen bolts on our grab bar? ive got one missing too... so i cut a piece of circular plastic and sprayed that and the rest of the Caps... GOLD! can you post a picture about it? any suggestions? or comments about the turn lights? I bought mirrors with indicators built in - so will remove my original indicators. that's a good one side mirrors with indicators... can you post pics? the black color is gone, after kerosene bath, dry the chains using clean cloth, towels etc..